Home » Bible and Beyond » Discovering Hebron, Jeffrey R. Chadwick, BAR 31:05, Sep-Oct 2005. Discovering Hebron, Jeffrey R. Chadwick, BAR 31:05, Sep-Oct 2005. Most visitors depart unaware that just a thousand yards to the west, easily visible from the shrine, is the mound that was the site of the ancient Biblical city of Hebron. The hill, called Jebel er-Rumeide in Arabic, rises prominently above the surrounding buildings in the center of the modern city. Biblically speaking, before Jerusalem, there was Hebron. And except for Jerusalem, no other ancient city is more important in Biblical tradition than Hebron. The Bible tells us that after Abraham departed from his nephew Lot, he moved his tent and settled at the oaks (or terebrinths) of Mamre, which is “at Hebron” (Genesis 13-18). The Bible portrays Mamre as home to ethnically diverse folk that included Amorites and Hittites. Among them Abraham and his clan of Mesopotamians settled comfortably. Later, according to the Bible, Israelites coming from Egypt defeated a Canaanite-Amorite coalition that included the army of Hoham, the king of Hebron. Then under Joshua’s leadership they attacked and conquered Hebron itself (Joshua 10-3–10, 36–37). The clan of Joshua’s associate Caleb was the force that captured the Canaanite city and then settled in it (Joshua 14-6–15). Later still, David ruled from Hebron for the first seven and a half years of his reign (2 Samuel 2-11), until he was able to capture Jerusalem and move his capital there. Until 1964, Jebel er-Rumeide, also called Tell Rumeide, had never been excavated. The great Biblical archaeologist William Foxwell Albright surveyed the site in the 1920s. But it waited another 40 years, a Biblical generation, before it felt the archaeologist’s spade. The American expedition to Hebron, directed by Philip Hammond, of Princeton Theological Seminary, and later of Brandeis University, excavated the site for three summer seasons, in 1964, 1965 and 1966. Hammond’s work was interrupted by the Six Day War of June 1967, which saw the “West Bank” territories pass from Jordanian to Israeli control. His attempts to recommence excavations after the war were frustrated, and finally abandoned, when it became clear that Jordan would not be reassuming control of Hebron. An official report of the American expedition to Hebron still remains to be completed. Hammond, who had moved to the University of Utah, returned to the great Nabatean site of Petra in Jordan, where he had previously excavated the main theater, and spent more than 30 years excavating and restoring the Temple of the Winged Lions there. When I was in graduate school at Utah, Hammond encouraged me to study the materials from his excavation at Hebron as the topic of my doctoral dissertation.1 I supplemented that study with numerous trips to the site and contacts with Israeli archaeologists who subsequently excavated there. This is the first popular account of the synthesis of that research. Years after Hammond left Tell Rumeide, Avi Ofer of Tel Aviv University excavated at the site between 1984 and 1986. This was followed by a salvage excavation on the north side of the tell in 1999 headed by veteran Israeli archaeologist Emanuel Eisenberg of the Israel Antiquities Authority. As a result of the efforts of Hammond, Ofer and Eisenberg, we are confident that Tell Rumeide was indeed Biblical Hebron and have some idea of what the ancient city was like. The site is a terraced hill of 15 acres (approximately the same size as Jerusalem in King David’s time) about 20 miles southwest of Jerusalem. A 30-minute drive in ideal circumstances today, Hebron was a whole day’s walk from Jerusalem in Biblical times along the so-called “Way of the Patriarchs,” the timeless trail winding along the spine of ancient Israel’s central mountain range. Today, as in ancient times, the road is flanked on either side by gently sloping hillsides planted with vineyards, olive groves, fruit trees and grain fields, all surrounded by low rock walls constructed of stones gathered from the neatly cultivated ground. 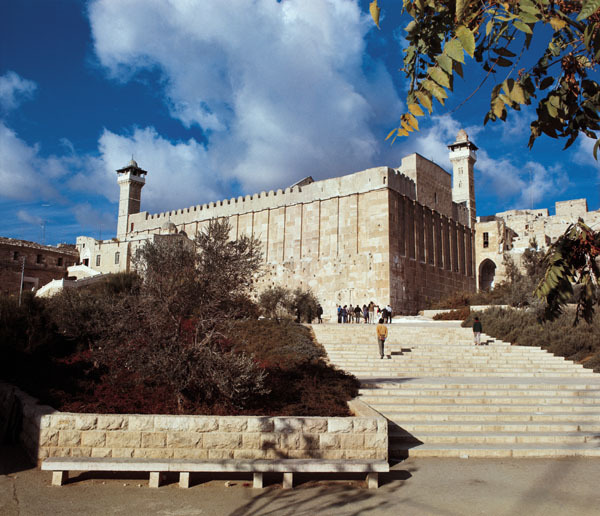 Perhaps it is symbolic that Hebron sits higher than any other Biblical city in the Land of Israel, perched 3,000 feet above sea level at the summit of Judah’s hill country. A perennial spring on the lower eastern slope of the tell, known in Arabic as Ein Jedida, was the likely water source of the ancient city. That spring, along with the hill’s relative defensibility, the fertile surrounding land and the hill country road made it an ideal site for an ancient settlement. Hammond’s American expedition to Hebron uncovered significant remains from the Early Bronze, Middle Bronze, Late Bronze and Iron Ages, as well as material from the Hellenisitic, Roman, Byzantine and Early Arab periods. I will discuss only the earlier levels here. During Early Bronze Age III (2600–2300 B.C.E.) the city was protected by a massive city wall over 20 feet thick. In 1964 Hammond excavated a 40-foot-long segment of this wall on the south side of the ancient city. It was built of large field stones, some more than 3 feet long. The flat top of this wall rose 8 feet above bedrock and may have been the base for a mud brick superstructure. In 1999, another segment of this wall, more than 45 feet long, was discovered on the north side of the tell by Eisenberg, who confirmed the structure’s Early Bronze III date. The segment of the wall that Hammond exposed on the south side came to an abrupt truncation at its east end, leaving a large gap in the wall line there. This suggested to me that a city gate probably existed at this point in the wall. Part of the west side of the presumed gateway was cleared, exposing a portion of the southern entrance to the ancient city. The presumed entryway may have been as much as 30 feet wide. Sometime in the 1970s, Hammond’s excavation squares were refilled by the Arab landowner and the Early Bronze wall segment Hammond had exposed was reburied. It is no longer visible at the site. However, visitors to Tell Rumeide can still view the Early Bronze wall segment unearthed by Eisenberg. Such a rampart would seem to indicate that a fairly sophisticated urban community existed at Tell Rumeide during in the Early Bronze Age III. But this settlement was destroyed and burned in about 2300 B.C.E. Since no ancient written references to the Early Bronze city exist, we do not even know its name, nor anything about its inhabitants. Like so much about Early Bronze Age Canaan, they are a mystery. The Middle Bronze II gateway with its massive tower may have found its way onto the pages of the Bible. In the account of Sarah’s death at Hebron, Abraham is reported to have bought the cave of Machpelah from Ephron the Hittite as a burial place for his wife. The cave became Abraham’s family tomb. This transaction took place in the hearing of “all who entered the gate” of the city (Genesis 23-10). When the Biblical author wrote these words he might well have had this gate and tower complex in mind since Hammond determined that it continued in use from Abraham’s time until the end of Iron Age II (sixth century B.C.E.). It would have been familiar even to the late writers or editors of Genesis. Could this gate and tower have been the actual site of Abraham’s famous real estate purchase? The possibilities are most intriguing. Hammond also cleared a Middle Bronze II burial cave on the south slope of the tell that also has a Biblical parallel. Designated as Tomb 4, it was a natural cave that contained eight burials (see photo on next page). In addition to over a hundred complete or restorable pottery vessels, more than 60 other objects were recovered, including jewelry, Egyptian scarabs from the Hyksos period (c. 1680–1560 B.C.E.) and toggle pins. The most handsome find, however, was a large dagger with a wide blade and a tennis-ball-sized limestone pommel into which a handle of wood had once been inserted. The dagger lay next to the skeleton of an aged man who had been buried in a loose garment fastened by one of the bronze toggle pins. The 10-inch bronze blade of the dagger had turned green from time. It may well be similar to the knife envisioned by the Biblical writer in the story of the binding of Isaac, when Abraham nearly sacrificed his son until the Lord ordered him to desist (Genesis 22-10). Does the Middle Bronze II Age archaeology of Hebron solve any of the questions that are sometimes raised in regard to the historicity of the stories of Abraham, Isaac and Jacob? Not really. Even if we found an object inscribed with the name Abraham or Isaac in hieroglyphs or cuneiform it would not prove the historicity of the patriarchal stories about those men. At a few other Canaanite sites from this period Egyptian scarabs have been found bearing the name Yakub, the hieroglyphic equivalent of Hebrew Yakov or Jacob.c Although the finds demonstrate that the name Jacob was in use during the period he is thought to have lived, none of those scarabs are thought to be references to the Biblical patriarch himself. That said, taken as a whole, the Middle Bronze II finds from Tell Rumeide present a glimpse of material culture and community life consistent with the Biblical accounts of the patriarchs. After all, they owned and traded sheep, used knives and other tools, as well as pottery vessels to store food and cook meals, and they were buried in a cave tomb outside the city. Abraham even bought his tomb in a transaction at the city gate. The material culture of Middle Bronze Age Hebron can be helpful in illustrating the Biblical stories of the patriarchs. To this extent archaeology may improve the accuracy of the picture of Abraham and his family that we paint in our minds when we read Genesis. The succeeding archaeological period at Hebron, the Late Bronze Age (1550–1200 B.C.E. ), is especially intriguing because until recently it was thought that there was no evidence of Late Bronze Age occupation there. And if there was no Late Bronze Age occupation of Hebron, it would have been impossible for the Israelites to capture it as the Book of Joshua says they did (Joshua 10-3–10, 36–37). And if archaeology demonstrated that there was no Late Bronze Age city of Hebron, then some would say that the Biblical story must be spurious. The view that there was no Late Bronze Age city of Hebron is largely attributable to Avi Ofer. After his excavations he definitively announced that Hebron was abandoned during the entire Late Bronze Age.4 Curiously Ofer did find decorated pottery sherds typical of the Late Bronze Age.5 But he did not discern surfaces accompanying those pottery samples, and thus discounted them. Unfortunately Ofer did not have access to the Late Bronze Age evidence found by the American expedition to Hebron for comparison. Hammond had found remains of Late Bronze Age occupation in six different areas.6 Hebron was in fact an active city during the Late Bronze Age, particularly in Late Bronze II. In some cases, Hammond determined that houses built in the Middle Bronze Age continued to be used in the Late Bronze Age, as shown by the pottery found in them. A room in one structure located in Area 6 in the center of the ancient city yielded fragments of typical Late Bronze Age painted pottery and imported Cypriot “base ring” vessels. In the same room (which I designated Room 1096 in my research) Hammond discovered a Late Bronze II arrowhead and a limestone scarab bearing the prenomen of Pharaoh Ramesses II, User Ma’at Ra Setep N Ra (Ramesses’ throne name).7 Ramesses II dominated Canaan during much of his long reign (1290–1224 B.C.E. ), near the end of the Late Bronze Age. And he is often thought to have been the pharaoh of the Exodus. Hammond also found a Late Bronze Age burial cave south of the city wall line. Designated Tomb 2, it had unfortunately been looted shortly before his arrival at Tell Rumeide. The thieves left behind only scattered Late Bronze Age pottery sherds. But those were enough to establish the date of the tomb. All in all, the evidence is strong that Hebron was a thriving city in the Late Bronze Age just before the time the Bible says the Israelites captured it. The Middle Bronze Age II wall that protected the city in the Late Bronze Age (and which continued in use for another six centuries until the end of Iron Age II) may also have found its way into another Biblical narrative. When the Israelites were camped at Kadesh, Moses sent two scouts to spy out the Promised Land to see what the Israelites would be facing. Among the places they reconnoitered was Hebron, where, among others, the “Children of Anak” (Biblical giants) were said to be living (Numbers 13-22). Upon their return to the camp of Israel, the scouts reported that the Canaanite cities “have very large fortifications.” The text then adds, “And we also saw Children of Anak there” (Numbers 13-28). The Children of Anak are mentioned only in connection with Hebron, which indicates it may have been Hebron’s high and massive Middle Bronze II wall, still in use centuries after it was built, that was in the mind of the Biblical writer when he composed the spy narrative. The Deuteronomic version of the same event employs picturesque hyperbole in describing Canaanite cities like Hebron as being “walled up to heaven” (Deuteronomy 2-28). By the end of the Late Bronze Age, it appears that Kiryat Arba (Town of the Four [Giants]) had replaced Mamre as the name of the late Canaanite city. In two places the Bible records that “the name of Hebron before was Kiryat Arba” (Joshua 14-15, Judges 1-10). The name “Kiryat Arba” is recorded in four other Biblical references as well (Genesis 23-2, 35-7; Joshua 15-13, 20-7). At the end of the Late Bronze Age II, some of the Middle Bronze II gate tower’s cyclopean stones were dislodged, crashing down upon the Early Bronze Age wall podium below. But the tower was repaired in Iron Age I (1200–1000 B.C.E. ), and the wall and gate complex continued in use all the way down to the end of Iron Age II (1000–586 B.C.E.). At about the same time, the end of Late Bronze II, that the city gate’s cyclopean stones came crashing down, Room 1096 of the structure in the city center that I described earlier was badly damaged by an intense fire. Another such structure further east (also erected in Middle Bronze Age II and utilized throughout the Late Bronze Age) was deliberately razed and replaced by an Iron Age pillared structure (probably an Israelite four-room house). It is tempting to attribute these destructive events to invading Israelites, as reflected in the Joshua narrative. And that may very well have been the case. However, a good deal of caution must be exercised in this regard. The area actually excavated by Hammond was very small, equivalent to only about a dozen 16 x 16-foot squares. This is simply not a broad enough sample for us to draw any absolute or wide-ranging conclusions. But it can certainly be said that nothing excavated at Hebron so far is in any way inconsistent with the Biblical tradition. Remember that it is not the purpose of Biblical archaeology to prove the Bible. Rather, Biblical archaeology is the intersection of scientific archaeological research and the historical study of the Biblical texts. Its goal is to help illuminate and illustrate the physical background and the material culture of the Bible. We certainly cannot prove or disprove the religious beliefs of the people described in the Biblical narratives. With a few notable exceptions, we usually cannot prove that individual Biblical persons did or did not exist or that individual events described in the Bible did or did not happen. But the archaeology of Hebron provides an example of how the physical evidence could, in addition to other scenarios, accommodate the Biblical stories in Genesis and Joshua. The material culture at Hebron during Iron Age I (1200–1000 B.C.E.) was similar to other Iron I sites in the country that are identified with the earliest Israelites. The pottery includes fragments of collared-rim jars that are often associated with the early Israelites. The strucure in Area 6 at the city center that suffered fire damage at the end of the Late Bronze Age II was refurbished with new plaster and floors and was used throughout Iron Age I and II. The continued use of this building may echo the Biblical tradition in which the Israelites took over cities and houses that had been built by the Canaanites. Israel was told it would inherit “cities that you did not build and houses full of all good things that you did not fill” (Deuteronomy 6-10–11). In Joshua 24-13 the Lord told the people- “I have given you a land for which you did not labor and towns you did not build.” Could the Biblical writer have had in mind structures in Hebron that survived from the Middle and Late Bronze Ages and were still being used by the Israelites at the end of Iron Age II? Again, the possibilities are intriguing. Hebron was David’s royal capital for the first seven and a half years of his reign. The remains of his residence—if there are any—probably lie beneath the summit of Tell Rumeide. It is covered, however, by a medieval structure (originally a Byzantine monastery) that local Arabs call Deir Arbain. Hammond carefully surveyed the Deir, but due to an unlikely tradition linking the ruin to the burial of David’s father Jesse and grandmother Ruth, the Israel Antiquities Authority would not authorize Hammond and his successors to excavate in or around it. As a result we can conclude almost nothing archaeologically concerning David’s reign at Hebron. The beginning of David’s reign is generally dated to about 1000 B.C.E., the transition point from Iron Age I to Iron Age II. At this time Hebron was not only walled and occupied, but judging from finds both inside and outside the wall line, its thriving population seemed to be growing. This, along with the presence of other walled and growing cities along the spine of Israel’s hill country, such as Jerusalem and Shechem, lends support to the argument that the critical mass for an Israelite state was in place as the tenth century B.C.E. dawned. The last reference to Hebron in the Bible is in the story of Absalom’s revolt against his father David (2 Samuel 15-7–10). Biblical tradition is silent about Hebron thereafter. Nor are any references to the city found in Egyptian, Assyrian or Babylonian texts. Hebron seems to have become historically anonymous in Iron Age II, overshadowed by Jerusalem, now the capital of Judah. But the city carried on. Though Biblically anonymous, Hebron continued to thrive. No longer the capital of Judah, the city seems to have settled into the role of regional center. This is demonstrated by the phenomenon of l’melekh handles. The term means “(belonging) to the king” or “property of the king.” The four-letter Hebrew designation (LMLK) was stamped into the wet clay of the handle of a certain type of storage jar at the end of the eighth century B.C.E. The jars were probably produced during the reign of King Hezekiah in preparation for the attack on Judah by Sennacherib’s Assyrian army, which occurred in 701 B.C.E. L’melekh handles display either a two-winged sun disk or a four-winged scarab, but, more importantly for our purposes, they also include the name of one of four cities of Judah. One of these four cities was Hebron. From all over Judah, more than 500 such jar handles stamped LMLK HBRN (l’melekh Hebron) have been found by archaeologists. Hebron itself was likely the original distribution point for these LMLK HBRN jars. Seven of these stamped handles have been recovered in excavations at Tell Rumeide.11 This may demonstrate that Hebron in Iron Age II was a royal administrative and distribution center of vital importance to the government and the defense of Judah. Although Sennacherib was unable to capture Jerusalem, he boasted of having destroyed 46 walled cities in Judah. Hebron was surely one of them. 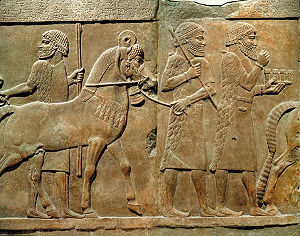 Its citizens were part of over 200,000 Judeans Sennacherib claims to have deported to Mesopotamia. Hebron revived again later in the seventh century B.C.E., but it was again savaged by Babylonian forces in 589 B.C.E. Its 1100-year-old city wall was pried apart and pushed over. Only its eastern gate tower survived to any significant height, probably due to the sheer massiveness of its original Middle Bronze Age II construction. Unearthed by Hammond a full 40 years ago, it still stands at Tell Rumeide today, a silent witness of the reality of Hebron’s Biblical past. a. Nancy Miller, “Patriarchal Burial Site Explored for First Time in 700 years,” BAR, May-June 1985.
b. Ronny Reich and Eli Shukron, “The Light at the End of the Tunnel,” BAR, January/February 1999. 1. See Jeffrey R. Chadwick, “The Archaeology of Biblical Hebron in the Bronze and Iron Ages- An Examination of the Discoveries of the American Expedition to Hebron” (University of Utah Middle East Center, 1992). Professor Hammond kindly shared with me all the available documents from his excavation, including his field notes, pottery notes, and stratigraphic notes and charts. The author expresses gratitude for Professor Hammond’s continued willingness to share information regarding his excavation at Hebron. 2. Avi Ofer was unaware of the Early Bronze Age wall and gateway Hammond excavated because they were unpublished and had been reburied in the 1970s. Ofer interpreted the small segment he found as a straight continuation of the Middle Bronze Age II wall running east from Hammond’s tower. But the location and alignment of the segment also fits into the proposed plan of an eastern gate tower. The author expresses gratitude to Ofer for sharing information about his excavation during the 1980s prior to its publication. 3. vi Ofer, “Hebron,” New Encyclopedia of Archaeological Excavations in the Holy Land, vol. 2, pp. 607–608. Also see Moshe Anbar and Nadav Na’aman, “An Account Tablet of Sheep from Ancient Hebron,” Tel Aviv 13–14, pp. 3–12, and Moshe Anbar, “A Cuneiform Tablet from the 17th-16th Centuries B.C.E. Discovered at Hebron” (Hebrew) Qadmoniot 22, no. 3–4, 1989, pp. 94–95. 5. Ofer, “Tell Rumeideh (Hebron)—1986,” Excavations and Surveys in Israel 1987/88, p. 92. 6. Continuing research on the Late Bronze Age at Hebron and the American expedition to Hebron (AEH) finds that relate to that period was conducted by the author during his 2003–2004 appointment as senior research fellow at Jerusalem’s William F. Albright Institute for Archaeological Research. The Late Bronze Age finds were presented publicly in his scholarly presentation at the annual meeting of the American Schools of Oriental Research (ASOR) in Atlanta, Georgia, in November 2003. That material is also currently being prepared for scientific publication. 8. Yuval Peleg and Irina Eisenstadt, “A Late Bronze Tomb at Hebron (Tell Rumeideh),” in Hananya Himzi and Alon DeGroot, eds., Burial Caves and Sites in Judea and Samaria From the Bronze and Iron Ages (Jerusalem- Staff Officer of Archaeology—Civil Administration of Judea and Samaria/Israel Antiquities Authority, 2004), pp. 231–259. 9. New research on AEH finds from Iron Age I at Hebron was initiated by the author during the 2003–2004 appointment at the Albright Institute in Jerusalem and is tentatively scheduled to be delivered at the ASOR annual meeting in Philadelphia in November 2005. The author expresses thanks to the Albright Institute and its director Seymour Gitin, and additionally to the Brigham Young University (BYU) Jerusalem Center for Near Eastern Studies and the BYU Religious Studies Center for material support of the ongoing AEH Review and its related research. 10. Emanuel Eisenberg and Alla Nagorski, “Tel Hevron,” Hadashot 114, p. 92. The author expresses gratitude to Eisenberg for valuable advice and for sharing additional information about his finds at Hebron in advance of their publication. 11. Ofer, “Hebron.” p. 609. Eisenberg and Alla Nagorski, “Tel Hevron,” Hadashot 114, p. 92.